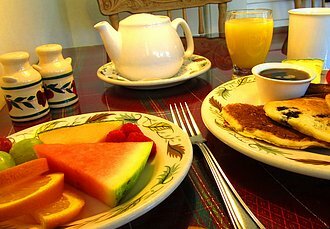 We offer an extensive breakfast buffet from 8:00 - 9:30 AM. Each morning there is a different egg dish or blueberry pancakes served with either bacon, sausage or ham. There is also a selection of yogurts, fresh fruit, cereals as well as a variety of multi-grain breads for toasting. Our jams are made at the Inn using an interesting variety of local fruit. Coffee, tea and juices are included. A great way to start your day!